Today in math class, we were given sheets of papers that had 10 algebra questions on them. We had to only do 8 of those. For today's scribe, I'll help you with 4 questions of the 8, so you will only have to do four. 1. A certain number plus 26 equals 51. What is the number? 2. Three more than twice a number is nineteen. Find the number. 3. Six times a certain number minus eight is forty. What is the number? 4. Terry has a certain amount of money and Rick has three times as much. If together they have $2.60, how much did each boy have? They each had ___ dollars/cents. This one is different, so we must first identify what we know about each person. They each had $0.65 cents. That is all for today, I don't think we had any other homework. Today in Class we did computer Stuff. So I'm going to show you step by step where to do and what to do. - Now you Copy down what you need to do on Math. - After you done all of it...Well you click on Save. - When your done all that you click Shared than type in your Email and your group's email. That's all the things you need to do. Sorry if I miss any step. Hi everyone! Today in class we did more word problems on pg. 47 and pg. 48 in our lavender booklets. I'm here to show you how to solve 2 problems on each page. 2. Suppose you have $40 and earn $7 per hour. How many hours must yoiu work until you have $131? First you must have a Simple Sentence Answer and showing what the variable equals. 3. Valley Video charges a $15 annual fee plus $3 per movie for rentals. Last year, Jennifer spent $99 at the store. How many movies did she rent? 3. Valley Video charges a $12 annual fee plus $3 per movie for rentals. Last year, Jennifer spent $90 at the store. How many movies did she rent? 5. Suppose you are a salesperson for Quark Computer Company. Each month you earn $400 plus one sixth for your sales. What amount must you sell this month to earn $2000? Sorry if I made any mistakes! The next scribe is Vincent! So hows everyone doing ? I went to a hotel today like a Resort type thing , but just to go swimming it was fun. I saw a llama! It was funny , it was like eating the leave from a tree then I like called it and it looked at me then started walking towards me. LOL , I dont know. WELL , tomorrow im hopefully going to the beach . Ill bring back lots of pictures though. Talk to you guys soon . Hi Guys, so now I want to come home. There was an earthquake. D; A very little one here in Lima, but in Ica and Pisco it was worse. I´m having fun , except today because of well the earthquake. It already stopped though. Lol. So I miss everyone! Okay I better go just in case anything else happens. 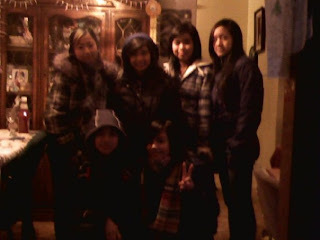 I MISS YOU GUUUYS! Today in Math class, Mr. Harbeck showed us how to turn an algebraic problem solving into an algebraic equation and then answer it. I have chosen the last 3 algebraic problem solving from page 45 on the purple booklet, because a some people were having trouble answering them. Here is my first example from page 45, letter C.
C. Three desks and a bookcase together weigh 157 lb. The bookcase weighs 34 lb. How much does each desk weigh? First you have to write a simple sentence like: Each desk weigh ____. To complete this sentence, you have to figure out the equation for this problem solving, and answer it then verify to see if it's correct. To finish it you will have to complete the sentence which is: Each desk weigh 41 lb. Here is my next example. This example is also from page 45, letter O.
O. Oshgosh would like to buy a new pair of skates for $115. So far he has saved $40. If he earns $7.50 per hour, how many hours must he work until he can buy the skates? For this kind of algebraic problem solving, we will do the same thing which is to write a simple sentence. The sentence would be: Oshgosh will have to work for ___ hours to buy the skates. To complete this sentence you will have to figure out the equation for this algebraic problem solving, answer it and then verify to see if it's correct. Now you will have to solve the algebraic equation. To finish this equation you will have to complete the sentence for this algebraic problem solving. The sentence will be: Oshgosh will have to work for 10 hours to buy the skates. Here is my last example. This example is also from page 45, letter T.
T. Mr. Piper's plumbing needed repairs. The plumber charged $98 for parts plus $45 per hour for labor. If the bill totaled $458, how many hour of labor wee required? To answer this algebraic problem solving, you will have to figure out what the equation will be for this, and complete a sentence. The sentence will be: ___ hours of labor were required. Also, as always you will have to answer it and verify to see if it's right or wrong. Now, to finish off this algebraic problem solving, you will have to complete the sentence for this. The sentence will be: 8 hours of labor were required. REMEMBER TO STUDY ALGEBRAIC PROBLEM SOLVING FOR THE MATH TEST ON MONDAY! (IF YOU NEED MORE HELP, JUST ASK MR. H). So, today in class we all had a math test/quiz (Whatever you want to call it) At the end of the quiz we corrected the answers. Here are 4 questions from the quiz that we had today, hopefully this will help all of you. On January 20th, 2009, in class, Mr. Harbeck taught us how to solve multiplicative algebra equations. He also reviewed how to solve adding and subtracting algebra questions. Thes are some of the questions he gave us to do in class and for homework. Today in class we talked about what we are going to do for the quiz tomorrow. For the quiz, Mr. Harbeck is going to take some of the questions we did on our homework on page 43. We also corrected our homework from page 43, and 44. Today, our home work is page 46, and 45 in our purple book. On 46 we only have to do 6 questions, and on 45 we have to do E to W. Below you are going to see some examples of the kind of questions that you might see on the quiz tomorrow. -The slashes that you see in the questions are dividing symbols. HEEEEY GUYS . Im supposed to write like a journal thing . (; So I will . lol . Sooo , im in Peru .. At my aunts house.. in Lima .. which is the Capital of Peru. It is SOOO hot here. I havent done much .. except buy some ice cream. YUM. Im going shopping later.. i think. I WANT TO GO TO THE BEACH! I miss you guys already! haha. Hey guys! Hows it going!? Im having lots of fun here. Its so different! Its really humid and dry and the way people drive is CRAZY! They dont really drive in the lanes they just go where ever they want, its pretty funny actually. Its also weird at the same time because I havent seen an accident or heard of one yet! I havent gone to the beach yet , which is sad! I havent really done anything, but im going to do lots once I get to Ica! I will post some pictures later! I just havent got any yet. Lol , Ill make sure to take some today and post them! Hey again! Lol , well its fun here! Tomorrow morning im leaving for Ica for about a week and a couple days I guess. I might not be able to go on the computer that much because my grandma doesnt havent one , but my cousin does . So whenever I go to my cousins ill go on. So I havent really said much about Peru have I? Well I will. Here in Lima they have a lot of the same fast food resturants as Winnipeg , like KFC , Burger King , McDonalds , Pizza Hut and they also had Payless Shoe Source here which I never would of guessed! I havent done much here in Lima because my mom was mostly shopping for her business, but when i go to Ica Im going to go to the beach , the pool , sandboarding and lots more! It´ll be fun! Well i miss you guys a lot. Ill talk to you soon! Today in class we went over the homework that was assigned yesterday. Here are a few of the questions that are answered. what if the N was negative???!! So Mr. Harbeck told us we can NOT have a negative N, so we have to change it right. NOTE: YOU CANT HAVE A NEGATIVE N! so what do we? add a negative one to both sides. Like this. Mr Harbeck asked me to show you how to divide with fractions. so now it way easy! okay now let's solve it! NOTE: TEST ON TUESDAY NOT ON MONDAY! Well today in class , i really dont get what we did .. lol , but ill try to explain it. Over the winter break we had to do something that is called "Pay it Forward", for my "Pay It Forward" i did was I take care of my Auntie son so yeah... Later on he was crying so i dint know what to do good thing i found a toy that is a car and he stopped crying. Well it was okay for me because sometimes i do it while my Auntie is at work. I felt really proud of my self because i made my Auntie son stop crying. Yes, anyone can make a difference just by making other people feel happy or proud of you. For Pay It Forward I went out side and shoveled my yard and my 2 neighbors yard. I baby sat my little sister and my younger cousins . My youngest cousin is not such a patient kid she is hyper doesnt listen and so on. While i was doing these i was offered some money i said no thanks and just to Pay It forward .They asked me how to pay it forward i told my mom and i told my auntie and they both said they would . When i shoveled i went inside and made a letter or a card the card was saying " Hi i did your drive way no need to pay me Just Pay It forward. If they asked how to pay it forward i left a message on the other side responding to what Pay It Forward was .Doing these good deed made me think if people help one by one everythingcould change if we use the system Pay It Forward. I did enjoy doing this project. The pictures that where taking could not be uploaded today but will be uploaded soon. Yesterday was the first day back and we got a new purple booklet. We also got new barn doors. We learned one step equations that were additive type and subtractive type. Mr. Harbeck mentioned that algebra is a balancing act. Whatever you do to one side, you have to do to the other side. For example, n+7=10. HOW DO WE MAKE IT BALANCED? The rules still apply, but now you're subtracting. For example, y-13=-5. it will be used with alot of different animations from a game that I play so enjoy. Over the Christmas Break, I decided to donate some glasses to the African kids. It all started a few days before Christmas day, I went with my mom to her work. In her office, there was a box with tons of prescription glasses in it. I asked my mom why they were in the box and she tld me they were for the kids in Africa who need glasses. When I got home, I thought about my Pay It Forward and searched my house for some glasses tha t my brother or parents don't use anymore. The next day, I went with mom again to her work, and put 2 from my brother and 2 from my parents! While I was there, I met some of my mom's friends and told them that I donated glasses and they should pay it forward too. ONE person CAN make a difference. In a few weeks, the box of glasses will be shipped to the kids in Africa who need them the most. For pay it forward I helped out on December 25,2008 12:30pm, I went to church and alter serve. Usually on Christmas I don't go to church since there are a lot of people. Alter severs do jobs to help out the priest when there's mass. We wore red and white.There were only 4 people alter severing at that time. My brother, 2 other people and I. Since I was the oldest among them, I had to carry the cross. :( I didn't like doing the cross because the person carrying the cross "leads" everyone to the front. When I was leading everyone to the front, I was wonder if I was walking too fast or too slow. Since I didn't want to make a mistake on a very special day. When I was at the front, I was relived that I didn't make any mistakes yet. When I looked at the audience, I didn't realized that there were that much people. I felt really nervous. Then later on in the Christmas mass, I suddenly felt sleepy. I kept yawning. Of all the days I could yawn it had to be now. I tried to stop yawning but I couldn't. So when the choir sang I sang with them. It made my yawning stopped. One problem fixed and another to come. When I was going to ring the bell, It felt like it was going to break. There were four bells on it and one of the bells felt loose. i was praying that on the second time I ring the bell that it wouldn't break. Luckily it didn't. It broke the next week I came. When mass ending, I was glad that I didn't make any mistakes. I was glad that I helped out on Christmas. Hi my name is Jai. 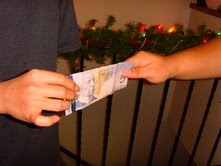 Over the Christmas Break, I had to do an assignment called pay it forward. Pay it forward is an idea that sombodey had to improve people's lives. to complete this idea one person has to give an act of random kindness to 3 people. Then you will tell each of the 3 people that they have to the same thing that you did for them to 3 other people. The thing that inspired our teachers to even think of doing this is a movie called "Pay It Forward". All of the grade eights got to watch it on the last day before Christmas Break. In the end of the movie, it becomes sad because the kid who thought of pay it forward died when he was trying to help another kid in his class that gets bullied a lot. Below, you will see pictures of what I did for this assignment. It includes before and after pictures. To pay it forward I shoveled my grandma and grandpa's drive way. I decided on doing that because I slept over there. One more thing that I did for this assignment was give money to my uncle. Below, you will see the proof. The proof is a picture. So now you see what I have done. Try this idea just for fun. Maybe you will see the beauty that we have created. If you carry on this thing we call pay it forward. On our last day of school all the grade 8 students watched a movie called "Pay it Forward". We were asked to complete a random act of kindness for a stranger or someone we know. 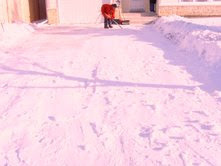 I decided to shovel my neighbours walkway because he hurt his back and isn't able to do much like shovel his walkway, and for him to shovel his walkway would cause him a lot of pain. I dressed up warm and made my way across the street to help him. 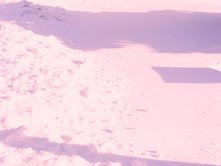 Then I knocked on his door, when he answered he greeted me and I told him that I would like to help him by shoveling his sidewalk, he seemed really grateful. He said to me "Thank you, but it's okay Courtney", I said "oh no, I would be happy to help you". He smiled and said "Thank you". 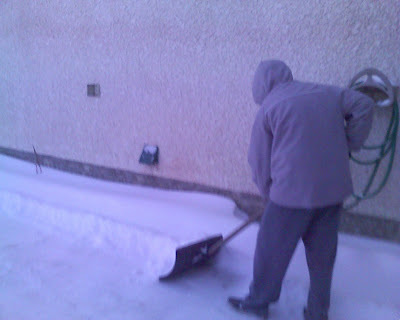 It made me feel really good to help him because I didn't want him to shovel his walkway and be in pain while shoveling. I explained the whole reason of "Pay it Forward", and asked him if he had the chance if he could also help someone who was needing help, and how it could make a difference in that persons life. Yes, one person can make a difference. Everyone can make a difference by lending a hand. A simple smile and friendliness can mean the world to someone. Hello and if you don't now me I'm Carlo. And I did this project called "Pay it Forward". Well at the holidays I didn't do anything that special, so somewhere close to New Years, December 31 to be exact. I did something super special asome in my house, then my cousins. Well I had to babysit my cousins. Surprisingly unaccepted happened, my cousins came to the house and jumped on me literally. While there mom is somewhere in the outdoor world doing something. While I babysat them they were playing with there own and Nintendo DS. Just for a short moment of time they actually escaped my clutches , that means the ran away somewhere in the house doing whatever they do normally, now if you are wondering what the do normally is to fight, yes fight. I had to separate them but i just got bamboozled by the little one not the older one of the brothers but the young one. After that little brawl I gave something free to them like a DS game or whatever plea shay thing they wanted. So I gave it to them. Now that's how generous I am. For the following hours my sisters were video taping them as they cause havoc around the house, eventually we got videos. If you look down at this paragraph there is one of the videos we captured. Now I felt super special good when I baby sat for them. My cousins reacted surprisingly enjoyed on what I did to them. I asked them to pay it forward but they didn't know what I meant. So when we had the celebration of New Years in my other cousins house I said these to all my relatives in there to pay it forward as I explained slowly. And there was About 20 relatives in there. So they tried to to the things I said. Labels: Carlo8-17, pay it forward. Hello people! My name is Rinorm and I can not believe I actually did something for this project. For the holidays we were asked to pay it forward by doing anything to help the world. For me, I decided to shovel my cousin’s driveway and my own driveway without charge. I decided to shovel my cousin’s driveway because on a cold snowy night they phoned my mom and said they were going somewhere. I realized that they were going on a holiday so I said to myself, "I'm going to shovel their yard tomorrow." And that’s exactly what I did. The next morning I put on my shorts, jogging pants, undershirt, t-shirt, 2 sweaters, a jacket, two pairs of socks and shoes. When I walked outside I was so cold because I have just learned that it snowed a lot early in the morning. I went to their back driveway and started to shovel. When I finished the driveway I decided to shovel their walkway too so I did. When I have shoveled everything I went back to my house. 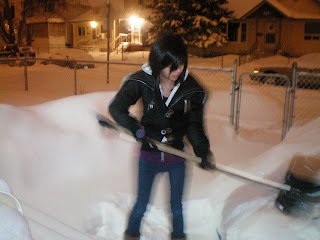 When I got inside my dad asked me to shovel our own driveway and that is what I did. When my cousins got home they phoned us and asked who shoveled and I said me and I said “Pay it Forward please!” and they said that they would try to. I was very happy. As you can see from this picture that i actually did this and I was very, very cold. Well I hope that I have encouraged anyone to "Pay it forward." I have to go now. Peace Out dudes and dudettes. On the last day of school, we watched a video called Pay It Forward, and we had to do our own act of kindness for someone we know, or a stranger. I decided to help my Grandma, by shoveling her sidewalk and front yard for her. The sidewalk was filled with a lot of snow, and I should've did this earlier, but I came on the day before school starts. When we got there it was already dark, because it's Winter and we came at 5PM. I started shoveling the sidewalk first, because it was hard to walk through with snow nearly up to your ankles, then I helped a bit with the front yard, but it was almost all clear already because she had cleaned some of it herself. After I shoveled the sidewalk and front yard, I went inside. She thanked me and I asked if she could try to do a kindness for another person, and I told her about the Pay It Forward project. She told me she will try to do an act of kindness for someone she knows and tell that person to do one for another, and so on. 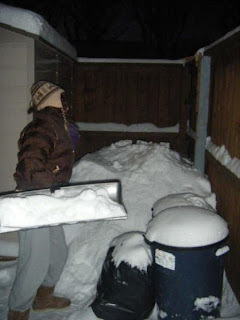 After that, I felt glad that she did not have to shovel all of that snow herself. I believe that one person, can make a difference in the world. All they have to do is do an act of kindness, and pass it on, and keep going. It starts to affect more, and more people in a good way, it's still making a difference. As long as the acts of kindness keep passing on, it will soon make a big, big difference in the world. That's how I see it. Have you ever thought of helping someone out , without getting anything back? I know most teens think "Oh that's a waste of time!" But really it's just a nice thing to do, especially if someone has done something nice for you. On the last day of school, before winter break all the grade 8 students watched a movie called "Pay It Forward" about doing random acts of kindness for people. We were given an assignment to do a random act of kindness ourselves, there were many possibilities. For my random act of kindness I shoveled the backyard for my dad. My dad said he was going to go shovel the backyard so i offered to do it myself and he was surprised because when he asks me to do it i say that it's to cold! I told him i would do it because i had to Pay It Forward. He asked me what pay it forward was and i told him about our assignment, I said because i was shoveling then he should pay it forward somehow too and he offered me money, but i didn't take it. I told him to do something nice for someone else. I thought it was really cold outside so I dressed up really warm so I was fine. It took be about an half an hour to finish the shoveling, which isn't that long, but i still did it because my dad has done a lot! On the last day before winter break, we watched a movie called "Pay It Forward". The movie was about a boy who wanted to help change the world, one person at a time. We were assigned to help change the world as well. I wanted to do something special, something that can put a smile on someone's face. Like make treat bags and give them to the Children's Hospital, or help at a nursing home. But, I wasn't able to do so since my parents were busy with other stuff. Although I couldn't have it my way, I realized that doing something helpful still counts. For this assignment, I decided to shovel the path to my house. My parents just came home from work and I overheard them talking about shovelling the sidewalk. They seemed tired after a day at work, so I thought I could shovel for them. So, when they went to sleep (they go to bed pretty early) I went outside and grabbed a shovel. When I was done with my house, I thought it wasn't enough. The path of my neighbour's house was covered in snow as well. I assumed that they were sleeping or went out since their lights were off. I didn't leave any note in the mailbox for my neighbour saying to pay it forward, but the next morning I told my parents to pay it forward. They asked what pay it forward was, so I explained to them about the movie we watched and that I did something that might please them. My parents were confused. As my mom was about to leave for work, she saw that our path was cleared up and seemed very happy about it. She asked me if I was the one who did it and all I said was, "Yes, now you have to pay it forward." I know I couldn't do the things I wanted to do, but I still ended up putting a smile on someone's face which was the whole point of this assignment. Even the little things like shoveling or picking up garbage can put a smile on someone's face. People may think that you have to be Superman to help someone, but you don't. Helping is helping, no matter what you do. Just imagine the difference between today and the future will be if you help someone one by one! For my act of kindness, I'm thinking of helping anonymous people like the elderly, children, and the homeless. Some of my ideas to pay it forward was to help at an old folks home, help at the Children's Hospital, babysit for free, volunteer at a Christmas cheerboard, shovel someone's driveway, do community service, do chores at home without being told, and to donate money, clothes, or toys. I thought about going to the Children's Hospital or Calvary Place. I'm going to pay it forward during the break. 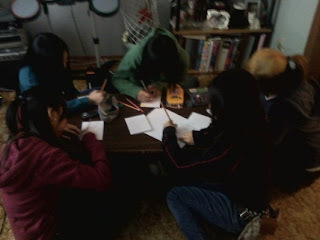 What I ended up doing was I made cards with Abby, Arielle, Carrie, Gelli, Arielle, and Tracy. The cards we made were about paying it forward, explaining what pay it forward is, why we are doing it, and how others can help. We all participated and equally shared the work by thinking, writing, drawing, and coloring. On the front of each card said, "Pay it Forward" and to read before thinking to even throw it out or something similar. If you think about it, do you think you'd read something handmade made by anonymous people in the mail? Would you throw it out without even reading it? I honestly probably wouldn't take the time to read it, but maybe if it said something like, Please read before throwing out." or "Before you even think of throwing this out, please read it." I'd probably read it. We also drew pictures on the front of the cards like flowers, cartoons, and forward symbols like the ones on a VCR. In the inside of the cards basically covered the who, what, when, where, why, and how. We also drew diagrams of one person paying it forward to three other people, each of the three paying it forward to three other people, and so on. We showed how it can spread quickly to many people and around the world. 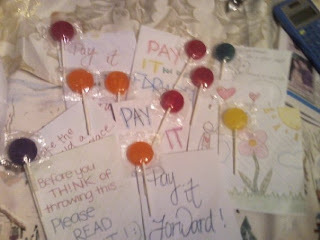 We also attached a lollipop to each of the cards to show our appreciation to pay it forward. 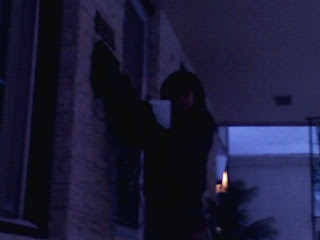 We put the cards into mailboxes of unknown people. I felt that I have done a good deed by spreading the message to others. I also felt like watching someone open their door and read what we had left in their mailbox and how they would react. I think the people whom I have given it to would have probably had a happy feeling reading the card and had a smile on their face wondering who had made the cards. I'm hoping that the people who received the cards actually read it and don't tend on throwing it out. I hope that they also pay it forward to help us spread the message. Do I think that one person can make a difference? I know someone can make difference, it may not be a huge difference like to stop global warming but everyone counts. Even if that difference is very little, it will continue to grow no matter how small it may be. It is almost like a tree, it'll start out small and it will take time for it to grow, but in the end it is a large beautiful tree, and all the waiting really paid off. I think if you really believe in yourself that you can make a difference in our world and that you never give up, you will make a difference. No matter who you are. Age? Size? Culture? Ethnicity? That all doesn't matter, what matters is what is in you! Every little difference can make a HUGE DIFFERENCE! EVERY PERSON COUNTS!